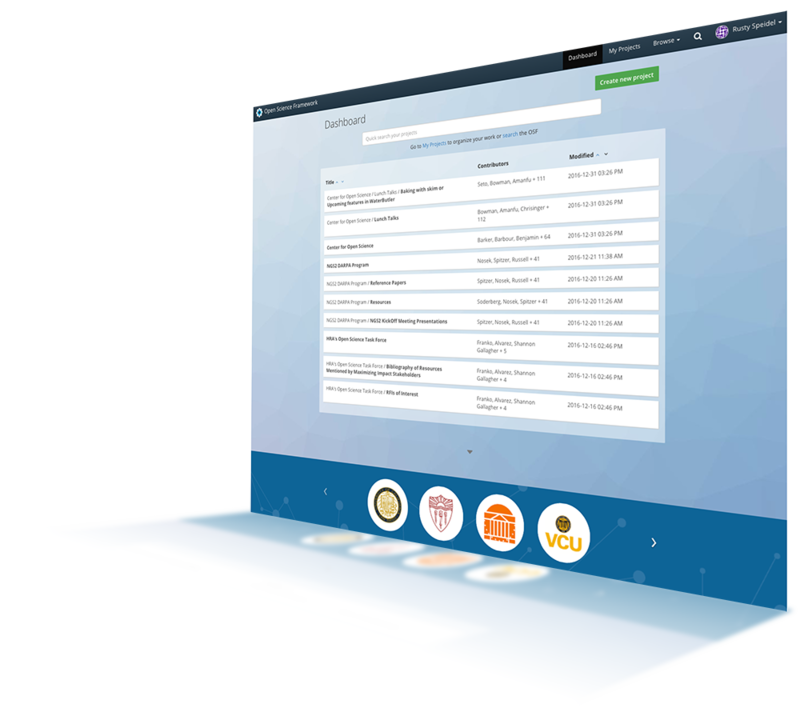 Manage and share your research with OSF — an easy, integrated platform. OSF is a free and open source project management repository that supports researchers across their entire project lifecycle. Dependable Repository: OSF's Preservation Fund preserves and maintains read access to any hosted data on OSF. This fund is sufficient for 50+ years of read access hosting at present costs. With OSF's workflow and storage integrations, you really can manage your entire project from one place. We connect the valuable research tools you already use, so you can effectively share the story of your research project and eliminate data silos and information gaps. Our ecosystem is designed to allow all those tools to work together the way you do, removing barriers to collaboration and knowledge. "I've done a fair amount of work with OSF for data management projects for librarian programs in New England, and it's integration capabilities with other tools (like Git or Google Drive) are fantastic." "I am just starting to play with Open Science Framework and impressed by the existing functionality. One of the really nice features is the live editing - this will make collaborative writing processes quite a bit more efficient, I anticipate…. Thanks for pushing this wonderful concept forward!" First of all, thank you very much for all the effort. The OSF/COS is a desperately needed solution in the current scientific system." "I recently started to use the Open Science Framework to store online some of my projects. My idea is to make them open as soon as I can (I cannot do right now due to sensible data stored there). As I have the plan to share the project, I want everything to be in perfect order so that everyone can really understand the procedures and methods of my experiments. This choice forced me to be more rigorous and I immediately experienced the positive effects of this. Now my research is better organized and efficient. I’m spending less time in sorting out stuff and my studies are running at a faster pace." OSF has a rich feature set that enables efficient, organized research projects. Your handy OSF project dashboard helps you keep all of your research and data at your fingertips. Add data, contributors, links to other projects, citations, make certain parts public or private, and even create preprints. Each project's wiki you can keep a running history of all the work you've done. Add components or folders easily. Projects can quickly grow, but OSF's structured approach keeps them clear and organized. Add folders, files, or additional research data. Analysis, code or paper drafts will probably change over time, and it is important to keep track of all these different versions. OSF makes it easy by automating version control for files with the same name. Registrations create time stamped, read-only versions of a project. This means that the files within the main project can continue to change, but the files in the registration will not. OSF allows you to share what you want, when you want. Everything on OSF is private by default. We also give you fine grain control over which aspects of the project are made public. Add-ons extend the power of OSF. You can connect other tools you use to OSF--like Dropbox, Github, or Figshare--so you can follow your current workflow in a centralized environment. OSF stores project usage information to help you measure the impact of your work. We give you insights about impact beyond citation rates so you can determine how many people are accessing and using your research materials.